How often have we thought of healthy meals for ourselves? 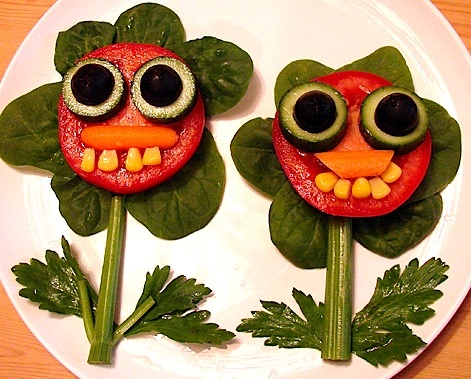 How often have we thought of healthy meals for our kids? If the answer to both these questions is the same and affirmative , there is nothing to worry. More than usual though, that is not the case. Naturally, most kids enjoy raw fruits and vegetables and they like to eat small meals throughout the day. Both are characteristics of a proper diet. Fats, refined sugars and refined carbohydrates are all unnatural foods that have crept into our diets due to man made processed foods. Their advertisements are also ‘oh! so catchy’ -children have gotten accustomed to these foods and will grow up thinking it’s OK. That could be a disaster to their health. The only relief being nothing happens overnight. A slow and steady reversal of this thought process will negate the bad effects on their bodies. Urban lifestyles today offer food varieties such as pizzas, cakes ,cookies, chips, candies, burgers, high sodium mac and cheese packets, sodas, ice creams in various flavors etc in such an abundant supply (with great packaging to attract our kids) . Our children have high energy activities and if one goes by the assumption that high intensity exercises will negate the calories of these foods, we could not be further from the truth. You would have heard ‘ every calorie is not the same’. That means a 100 calories from almonds is not the same as a 100 calories from a cheeseburger. The nutritional value of a food is actually pretty much common sense. Everyone knows leafy greens, fresh fruits, vegetables and basically foods as close to their natural state as possible are great for health. How good is it or rather, how bad are the White refined flours or sugars, is where everyone gets disconnected from reality. That’s why we see such a sudden rise in kids’ obesity, diabetes ,cancer, hypertension and other such scary diseases. It’s now a known fact that diet and health are correlated , we certainly can’t be so oblivious to that fact whenever we feed our kids sodas, burgers and chips! The muscles in our bodies are at their optimum best with clean eating and including protein and produce. All professional athletes know that and their diets are planned accordingly. What stops us from letting our kids thrive? Our laziness? Come on , maybe it’s time we discover amazing energy by eating such foods ourselves first. 1. Review the foods that we keep at home and thus serve our children. Get rid of the processed foods, get lots of fruits and vegetables. 2. Cut and keep the vegetables in handy packs with dips like hummus, yoghurt, salsa or guacamole. 3. Put the fruits out on the dining table at all times and if the weather doesn’t permit, at an accessible shelf in the fridge. 4. Squeeze lemons and keep everyday for lemonades. 5. Use a combination of 3-4 raw vegetables like tomatoes, cucumbers , sprouts, beetroots, corn ,romaine or iceberg at all meal times for salads. 6. Flavor water with lemon slices or mint and chill. 7. Make and keep ice lollies in the freezer with fresh fruit juices like water melon or oranges or kiwis or whatever they like. 8. Make smoothies with fresh fruits and milk or yoghurt everyday. Adding dates or raisins will make smoothies sweeter. Green smoothies are a great evening snack. 9. Recipe tips: Keep it simple eg. Freezing mashed bananas and raisins with cinnamon are a great dessert, freeze yoghurt with any cut fruits and garnish with crushed nuts in summers for snacks, make whole wheat pastas with fresh tomato purees, slice a cucumber with cheese for snack, hard boil eggs with salsa for snack, add spinach wraps ( wrap a leaf of spinach on a sliced tomato) to a meal. Being creative is fun when the only raw materials we work with are as close to how nature intended them to be. Basically, every time a child is hungry, he needs to have an availability of healthy foods at home. If no alternatives are kept, the child will not be averse to a fresh mango and milk for snack.There are many fun and healthy ideas, we just need the right ingredients. So, going over our groceries is a first. Above all, be a good example yourself – of eating great food and choosing the best options when going out. If you can make it look fun, it will be even better. The reward is a lifetime habit of eating well for our precious children. Patience is key, the rule being no forceful eating. All the best! This entry was posted in Nutrition and tagged eating well, healthy eating habits for children, healthy snacks for kids, Kids menus, processed foods and kids. Bookmark the permalink.